In the wake of the mass shooting in Chattanooga, Tennessee, investigators and the media have pored over the gunman’s personal life, trying to find an explanation for what might have caused the tragedy. As the FBI continues to look into the shooter’s potential terror ties, reports have already begun to reveal a troubling history of depression, drug use, and alcohol abuse — factors that are often implicated in mass shootings. Despite accounting for a small fraction of America’s overall gun homicides, mass shootings are often used as a proxy to better understand gun violence in general. The seeming ubiquity of mental illness and substance abuse as causal factors in these headline-grabbing incidents often leads to overarching conclusions about people who commit violent acts with firearms — particularly by pro-gun advocates who regularly blame mass shootings on mental illness. But academic research suggests that the link associating mental illness with shootings is less clear than gun advocates claim. And the correlation between drug use and violent crime, it turns out, is unclear. 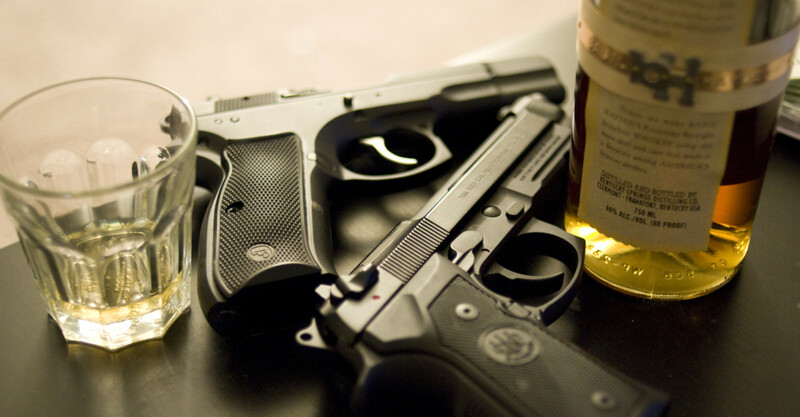 What a closer look at the data does reveal is this: Outside of the availability of firearms, the chief factor influencing gun violence is alcohol abuse. The mentally ill are statistically more a danger to themselves than to others. Mass shootings in the United States are often politicized by interest groups seeking to blame a particular segment of society for gun violence — video games and films, for instance, are regularly cited as culprits. For the National Rifle Association, the most common scapegoat for mass shootings is mental illness. Anecdotal evidence appears to substantiate this claim — after all, the gunmen responsible for the Aurora, Newtown, and Washington Navy Yard shootings all suffered from some form of mental illness. Wayne LaPierre, the executive vice president of the NRA, regularly champions the idea of a national database to identify individuals who suffer from severe mental illness. In a press conference after the Newtown massacre, LaPierre wondered how many more “deranged” individuals would “try to make their mark” with similar acts of gun violence, while lambasting the government’s refusal to adequately track the mentally ill. For pro-gun advocates, easy access to firearms is not a relevant factor in mass shootings; the real problem is mental illness. Yet there is remarkably little evidence to support the link between mental illness and violent crime. As a review of medical literature published earlier this year explains, 96 percent of violent acts are committed by people without a mental illness. Rather than being a threat to others, individuals with mental illness are far more often a threat to themselves. Roughly 15 percent of schizophrenics and people with major depression commit suicide in the U.S.; this is in contrast to an overall suicide rate of 13 per 100,000 (or .013 percent). What’s more, an international meta-analysis of seven studies found that, in several advanced nations outside the U.S., the annual rate of stranger homicide (when the perpetrator doesn’t know the victim beforehand) committed by people with psychotic illnesses was just 1 per 14.3 million. By comparison, the firearm homicide rate in the U.S. is around 3.5 per 100,000. A 2009 study of more than 34,000 participants in the National Epidemiologic Survey on Alcohol and Related Conditions further belies the link between mental illness and violence. It found that schizophrenia, bipolar disorder, and major depression fail to predict future violence — unless mental illness is paired with substance abuse. Prescription medications that treat mental illness reduce rates of violence. But again, there’s no substantive academic evidence linking prescription medications to gun violence in general. In fact, most research indicates the exact opposite: Prescription medications, when used to treat mental illness, actually reduce rates of violence. A 2010 meta-analysis of 10 studies found that drug treatments for psychosis lowered the rate of homicides committed by schizophrenics from 1.59 homicides per 1,000 to .11 per 1,000 — a 93 percent drop. A different meta-analysis examining antidepressants found that they significantly reduced suicidal behavior and ideation. There was no evidence that these drugs increased violent behavior. The substance most often associated with violent crime is alcohol.